Good afternoon, space fans! Here's what was floating around this week. Eight months up there, and still these guys are safe and hard at work. Well done, cosmonaut Kornienko (left) and astronaut Kelly! On Monday, the ISS crew held a moment of silence for the victims of the terrorist attacks in Paris. Scott Kelly posted a photo of the City of Lights from space, in solidarity with the French citizens. NASA astronaut Kjell Lindgren planted zinnia seeds in the Veggie experiment, which successfully provided the astronauts with fresh space-grown lettuce not long ago. The Veggie experiment is tremendously important research that could someday aid in long-duration travel to places such as Mars. In this particular instance, it's just adding some color to the station with the zinnias, but a crop of space-grown tomatoes is set to follow. Students on arth were able to join in the intrigue of the ISS, using a special remotely-controlled camera, the Sally Ride EarthKAM, to shoot images of Earth, from Earth...basically, the biggest selfies ever. A large variety of images from the EarthKAM are available in their gallery. Astronaut Scott Kelly was awarded Scientist of the Year by R&D magazine. Now eight months into his year-long space mission, Kelly is still operating in top shape. In a thank-you video upon accepting the award, Kelly stated, "I've learned that human potential is limitless, and we should never stop pushing the boundaries of exploration." He also recognized "all of the great scientists who came before me to make life in space possible." Here's to more research and development aboard the ISS! This week's station science included Kelly banking more blood and urine samples for the Twins study, in which he and his land-locked twin brother Mark are being studied for discrepancies in their physiology that make have been incurred by Kelly's year-long space sojourn. Another interesting experiment included the continuance of a telerobotics study, where a joystick operated in space acts similarly to one "slaved" to it on Earth. 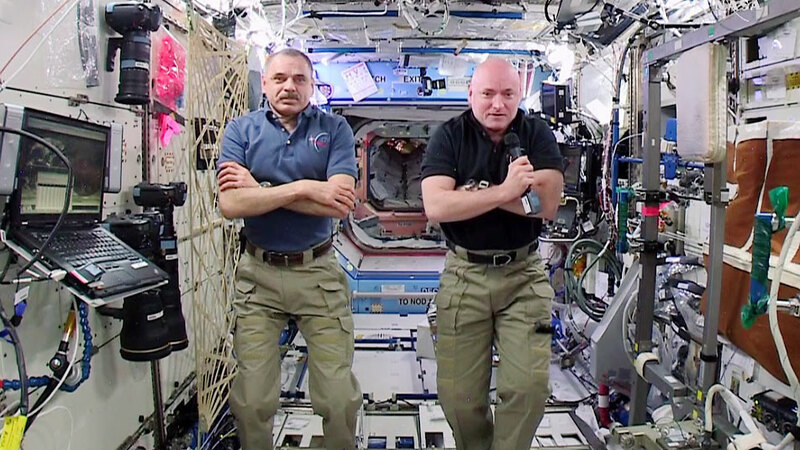 Let's face it, the ISS is the prime location for a buddy comedy. And soon, there'll be some new faces for the spacemen to befriend! The crew members of the upcoming Expedition 46/47 (Timothy Kopra of NASA, Yuri Malenchenko of Roscosmos and Timothy Peake of the European Space Agency) conducted final qualification training in Star City, Russia on Thursday and Friday. 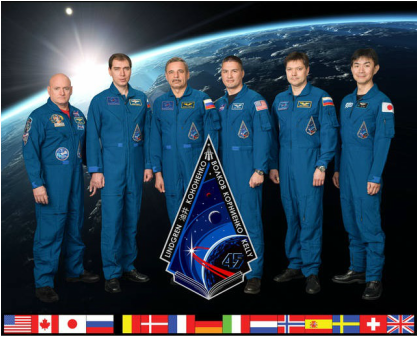 They are slated to launch for the ISS on December 15th, and they will remain in orbit for six months. Finally, the exceptionally-cheerful Kelly posted some great space-based "dawn" photos this week, including one with the caption, "Today is a new day with limitless possibilities to do great things. Good morning from the International Space Station!" Well, we guess it must be easier to be a morning person when you have the practice of sixteen sunrises a day! See you next week...watch this space! First step: get out of pajamas. Second step: space?